There are many reasons as to why rental businesses of many types could benefit from using equipment rental software. Keeping track of your inventory, sales, clients, and data all on your own could at times end up costing your company more than saving it. Here at EquipCalendar, our focus is on what we can offer your business, when it comes to managing these core aspects efficiently. Often times, small business owners will avoid using equipment rental software due to the high cost involved. Furthermore, they fear that there is such a large learning curve in order to efficiently set it up, that it would actually take way too much time away from their business in order to use it. With that said, many times they have already looked into setting up these type of services, but found that the companies they had been in touch with lacked any real value for their costs involved. Nonetheless, while this could be true for many service providers currently out there for small business owners, here at EquipCalendar, we actually focus more on the services we can give to our clients at a economical monthly fee. Our site is about you, the rental business owner, and we provide complete calendar solutions, based around many different types of businesses that could really benefit from the software. In addition, our elite group of software developers, who have well over 15 years of experience, have put together this software to help our clients utilize the crucial aspects when running their own rental companies. With that said, if you're a business owner, you already realize that you must keep track of your sales, scheduling and inventory in order to gain any type of real handle on your overall profit margins. However, while we do specialize in helping companies like consumer product rentals, welding equipment rentals, inflatable rentals, commercial and industrial rentals, we are not just limited to these types of service providers. Furthermore, for those who are party planners and wedding event companies that provide rentals of their equipment they too can benefit from using our equipment rental software. In addition, trying to install new software onto your own computers could also stop many companies from even using equipment rental software. That is, until now, as we provide our equipment rental software using the cloud. What this means for you the business owner, is that there is not going to be any type of installation requirement on your part. Furthermore, once you set up your account on our platform, there will never be any further upgrades needed. You, and your employees, will have access 24 hours a day, 7 days per week, and 365 days of the year to your events, inventory and calendar. We also offer to our clients a unlimited cap on the number of employees and staff that can access your business inventory records. There are plenty of reasons on why using equipment rental software in order to keep proper track of your sales, and inventory should never be overlooked until the business can afford it. One such reason, is that if you're still trying to keep track of all your products and services by the old traditional paper and pencil method, you could be setting your company up for an immediate disaster should a crisis arise, such as a fire. Taking the time to ensure that you always can have your data back in such a event is crucial to ensuring your company can bounce right back when need be. In addition, for those that provide any type of rental of products to the general public they need to be aware at all times what amount of inventory they have on hand. With that said, here at EquipCalendar, you will be able to see exactly what you have on offer within our real time tracking software capabilities. Furthermore, when you're a service provider that is running a party planning event for your clients you always want to be certain that your not over scheduling inventory in the process, and by using our software, your time management will greatly improve to ensure this never becomes a issue of having to turn clients away. When it comes to running a small business using equipment rental software, if you take some time to do a bit of research, it might just help you to make a better educated decision on what your company is needing. 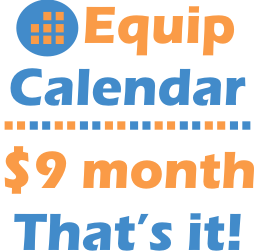 Finally we would greatly encourage our viewers to visit us here at EquipCalendar, and we just may be able to provide you with an easy, affordable equipment rental software solution for your needs.